Jaipur is the city draped in pink and therefore known as the Pink City. This unique idea was formed during the visit of Prince Wales. 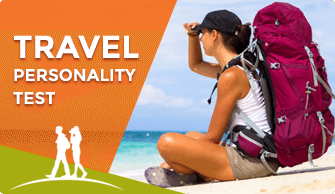 Till now tourists from all around the globe flock to the royal city of India. Flamboyant forts treasure years of history. Jaipur, in India, is the city of colorful palaces and mighty Rajas. When you step into the golden sands of the epic city, you will be taken back in time. The opulent Amber Fort stands tall after all these years. Perfectly planned streets and pink colored houses give the city an undeniable charm. You will be amazed by the sheer magnificence of Jaipur. Enjoy your stay here as you ride on the golden sands on back of camels. The capital of Rajasthan was named after the great ruler Jai Singh, who built the Amber Fort and the city surrounding it. He was in alliance with the Mughals during the start of his reign. 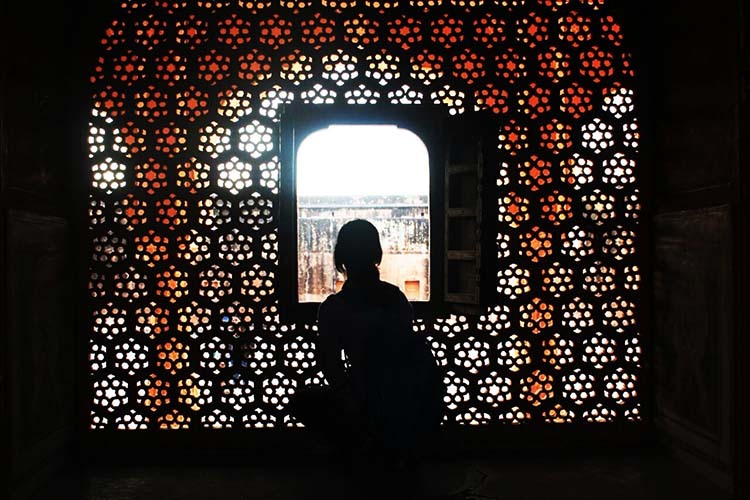 Because of this, you can easily see the Mughal influence on the Amber fort. You can take the elephant ride up the fort. That’s guaranteed to make you feel royal! There is no scarcity of forts in Jaipur. 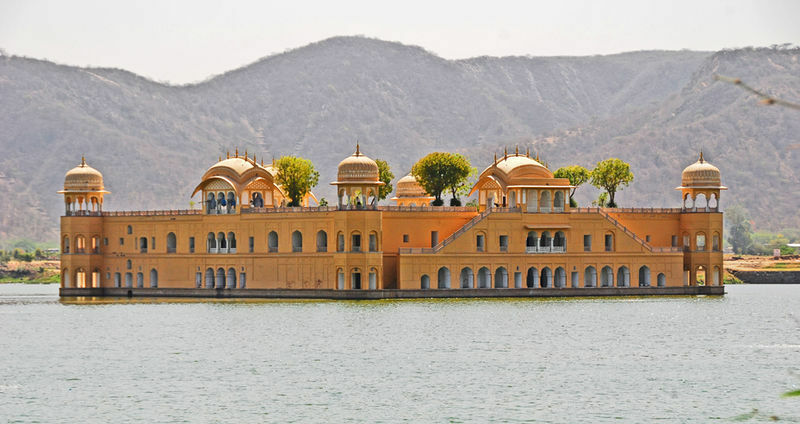 The Jal Mahal is another answer for the extravagant history of the city. This royal city has a brilliant collection of ancient but well-preserved and well-maintained palaces. You can visit the Hawa Mahal (Palace of Breeze) and Jal Mahal (Palace of Water), the top two attractions. Amber Fort is the supreme monument in Pink City. This part of the city is old and holds many royal palaces which are worth a visit. Walking through the opulent corridors, you can feel the desert winds blowing. Wrap up your trip with an entertaining show portraying the royal history of Jaipur in Amber Fort. 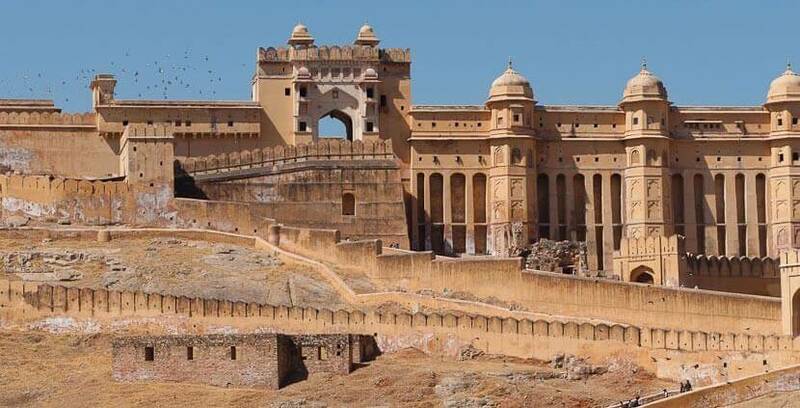 Another remarkable fort in Jaipur is the Jaigarh Fort. You can swoon over the scenic charm of the surrounding hills. If you want to know the brief history of the airport, you can hire a tour guide. Nahargarh Fort completes the trio of forts. It might be tiny but provides the gorgeous view of lakefront. 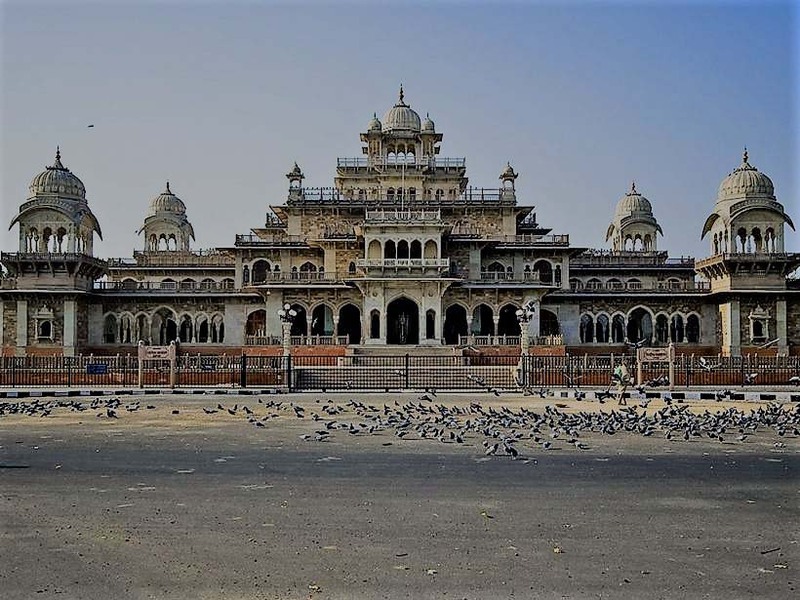 City Palace occupies the prominent part of the pink city and is also an amalgam of Hindu and Mughal architecture. There are many places to see here, the Chandra Mahal, Mubarak Mahal, Diwan-e- Aam, Diwan-e –Khas. Nahargarh Fort, also known as Tiger Fort, is perched high on the rugged Aravali Hills overlooking Jaipur city. Known for its sunset views it also has a number of new attractions recently opened like a wax museum, sculpture park, and fine-dining restaurant. 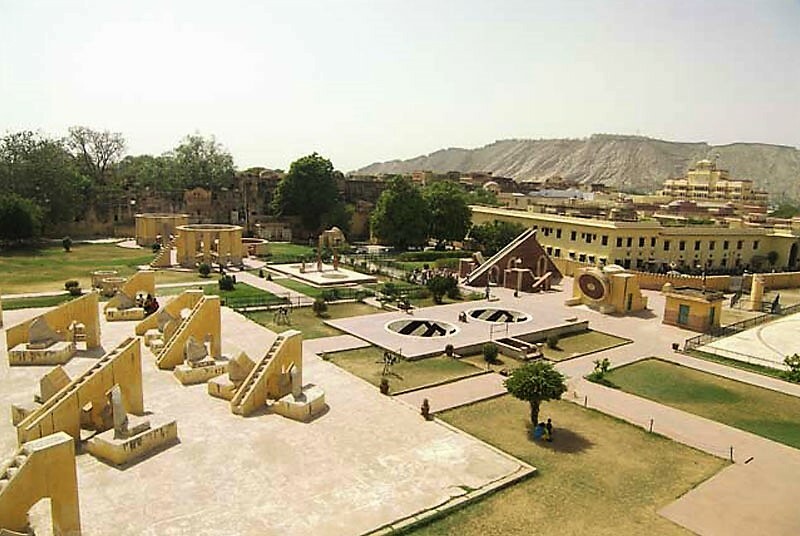 Jantar Mantar is a quirky destination for those who crave a unique experience. This observatory was built by none other than the intelligent emperor Jai Singh. You can go to Jantar Mantar (a collection of open sky theme architectural astronomy instruments). It is open from 9:00- 4:00 pm. Hawa Mahal is another architectural specimen of Jaipur. It is built in such a way that allows the Palace to cool naturally through the use of winds. Ethnic suits, metal jewelry, gemstones, and spicy food, are displayed right in front of your eyes here in front of the mahal. 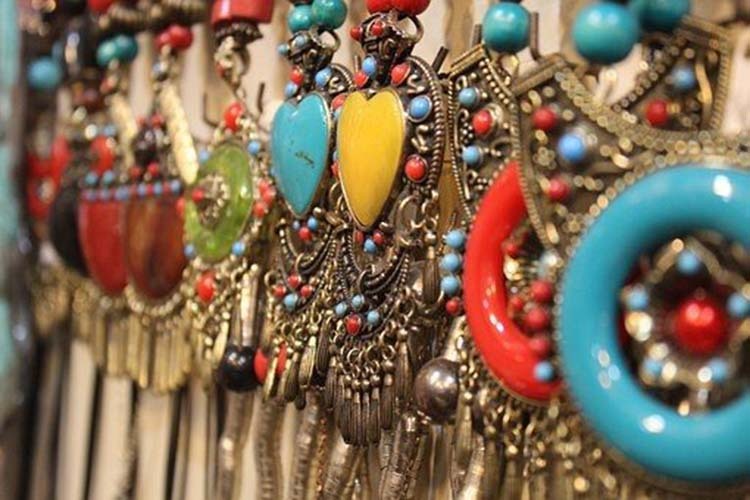 You are going to love the typical Jaipuri shopping. This old and famous museum was modeled on the Victoria and Albert Museum in London, with a fusion of Islamic and Neo-Gothic architecture. It was established as a public museum in 1887. The collection includes portraits of local kings, costumes, woodcarvings, paintings, and arts and crafts. 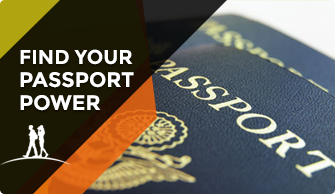 Get more information about it here. 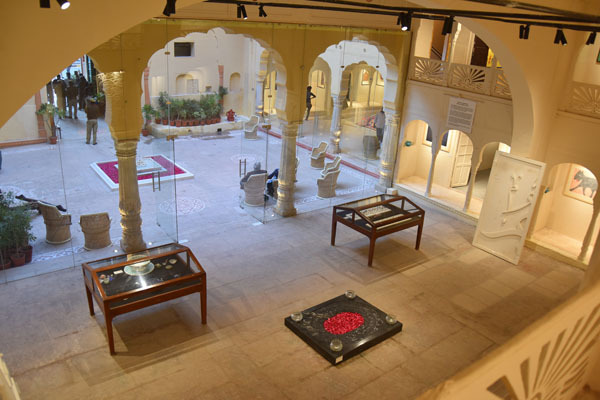 This new government museum, which was still in the process of being set up in early 2018, is dedicated to promoting the cultural heritage of Rajasthan. It has more than 10,000 square feet of exhibition space featuring previously unseen private collections of textiles, jewelry, stoneware and inlay work, paintings, pottery, photography. Admire the exotic architectural styles that combine both Mughal and Rajput characteristics at Jal Mahal also known as the Water Palace. Located in between the Mansagar lake it adds a charm to the lake with the presence of a building nestled within. Located next to the Albert Hall, the Jaipur Zoo is a great place to take the kids to. Explore many species of animals and birds or enjoy the lovely greenery around. Commonly found animals at the zoo are tigers, lions, panthers, and deer. Jaipur is an excellent place to shop and you’ll find an enticing variety of goods available there. 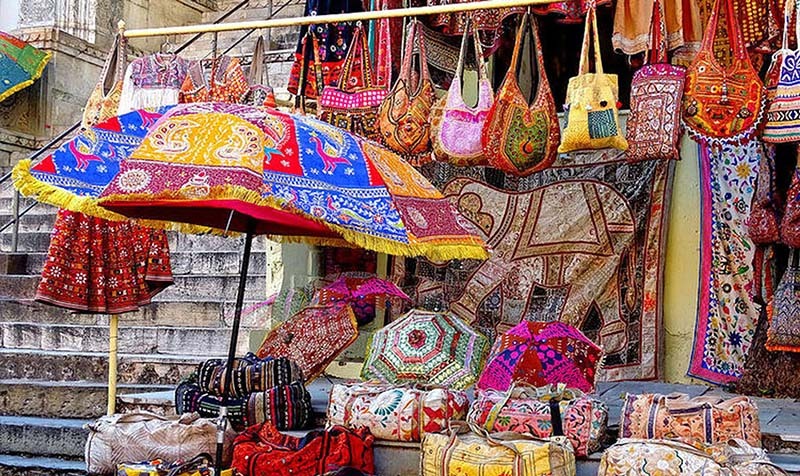 It is famous for its carpets, handicrafts, cloth, textiles, and sandals. This bazaar is very famous for its lac jewelry. You have to really scour through a lot of products as the choices are endless. Marble sculptures are something Chandpol bazaar is famous for. You can go through an array of shops with different shapes and sizes of sculptures. 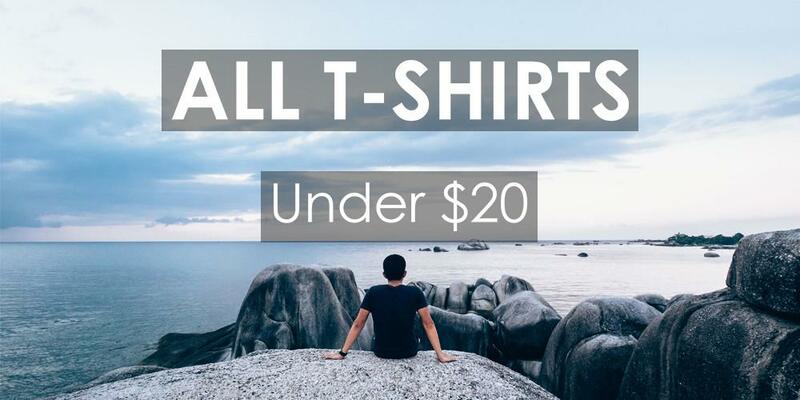 Bargaining is a must for you to get the best price for any product here. MI road, short for Mirza Ismail Road is one of the main shopping centers in Jaipur. You can get some amazing deals on wooden souvenirs and colorful handicrafts here to start with. The road seems never ending and you can get lost in time shopping here. Johari Bazaar, in the Old City, is renowned for bangles, inexpensive costume jewelry, gold, and silver. You can get all varieties of precious gemstones here which makes for excellent souvenirs to take back as they are not only easy to carry but beautiful too. Cycling – Go on a cycling expedition to Nahargarh Fort. Once you reach the top you can explore this fort and then enjoy a quick bite at the Padao Open Bar/Restaurant on the terrace of this palace whilst enjoying the views of the city. Elephant ride – One of the most fun things to do in Jaipur is to go on an elephant ride exploring the cobbled paths and large gateways of the Amer Fort. Experience Rajasthani Culture – Go to Chowki Dani to enjoy the electrifying ambiance of this village resort where you can enjoy puppet shows, magic shows, Rajasthani folk performances, acrobatics, camel rides, elephant rides, boating and much more. 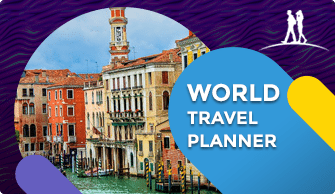 Folk Festival – Join in the festivities at the Pink City where Gangaur and Teej are celebrated with as much fervor as the Kite festival and Dhulandi Festival. Smear dry gulal (color) on each other well dancing to the tunes of traditional Hindi folk songs. The festival takes place in March every year at the Khasa Kothi. Jaipur Literature Festival – The festival which generally happens in January is one of the country’s biggest literary festivals that has played host to names like Amish Tripathi, Hanif Kureishi, His Holiness the 14th Dalai Lama, Oprah Winfrey, Orhan Pamuk, Salman Rushdie, Margaret Atwood, Stephen Fry, and many more. Stay at a Heritage Hotel – This is one of the best things to do in Jaipur as you get to experience the history and royalty of the Pink City by viewing the grand architecture, the rambling courtyards, the lush greenery and the serene alcoves of these royal structures. Glamping – Glamping has now become one of the most popular adventure activities in Jaipur. It is possible to go glamping at the Tree House Resort where the state-of-the-art amenities, iron wrought beds, leathered chairs are what greet you. 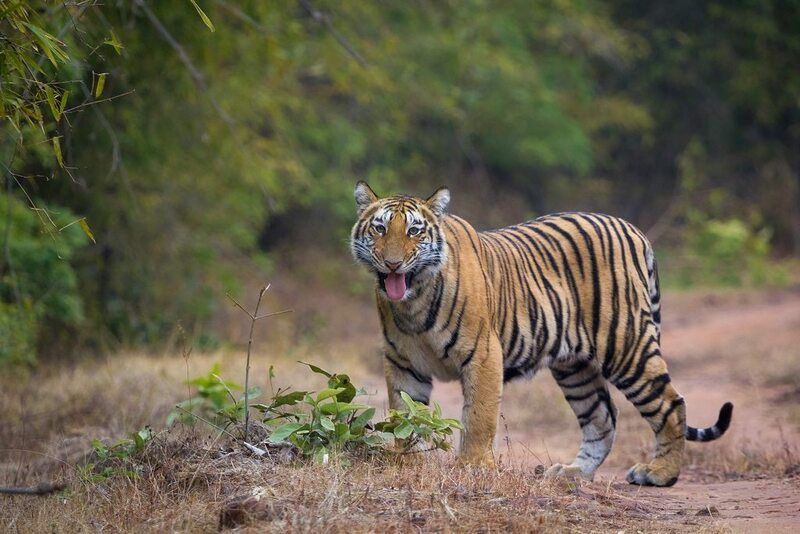 Ranthambore Wildlife Sanctuary – Go on a tiger trail at Bakula, hike up to the Ranthambore Fort, spot sloth bears at Kachida Valley, buy handicrafts at Dastkar Craft Centre and go on bird watching tours here. Camel Safari – You can explore the rustic areas of this city and then spend the night at a camp. The duration of the camel safaris varies from single-day trips to 3-4 days trip. Jeep Safari – Go on a jeep safari throughout the city and explore the various forts and jungles here. If you only have a day to explore the city, these jeep safaris are one of the best adventure activities in Jaipur. Hot Air Balloon Ride – These rides are popular things to do in Jaipur in one day and are mostly held two hours before sunrise and two hours before sunset. 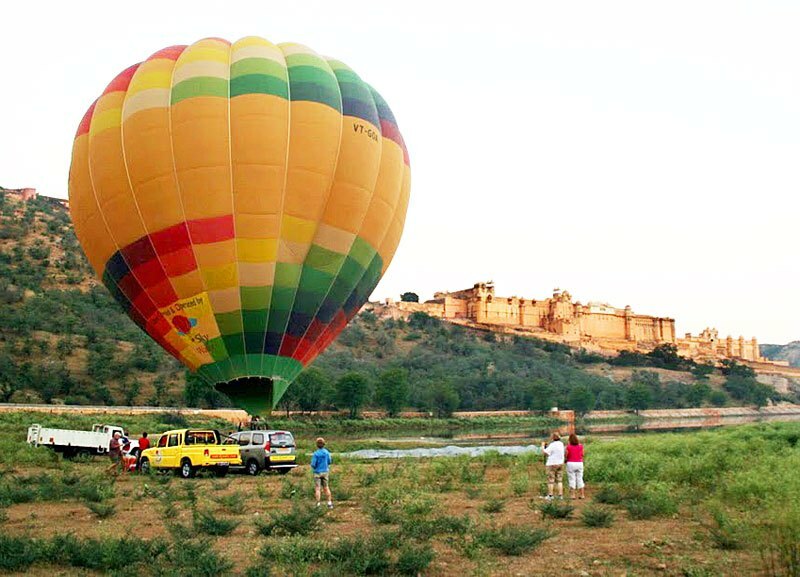 Most of the hot air balloon rides accommodate up to 8 people and start from Amber Fort. Getting to this rather ruinous but holy Hindi temple, nestled in peaceful surroundings between two granite cliffs, is quite an adventure but it’s completely worth the effort. The temple is part of a larger temple complex, which also has three sacred pools of water. One of the pools has been taken over by thousands of monkeys that congregate there to swim and bathe thus the name. Moti Doongari sits on top of Pearl Hill. It was built way ahead of Amber Fort and City Palace. The Monkey Temple, the Marble Temple, and the Govind Devji temple are expressions of the religious beliefs of the locals. 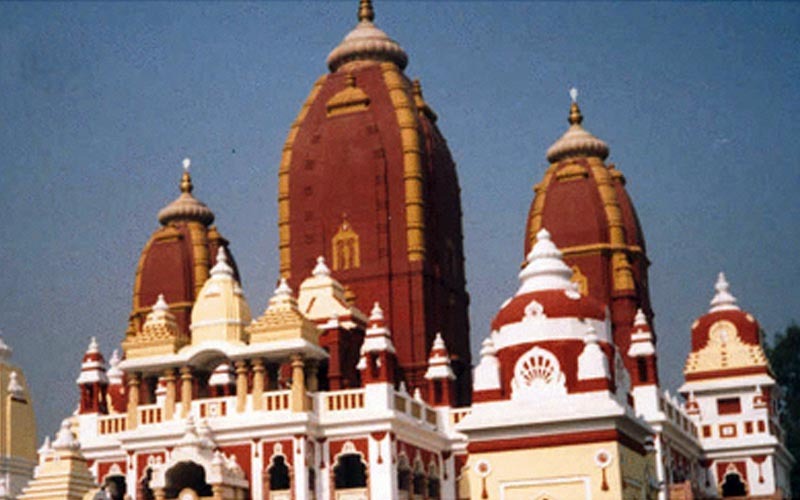 This temple is among the 7 temples of Thakur of Vrindavan including Sri Radhavallabh ji, Shri Bankey Bihari Ji, Shri Govind Dev Ji, and four others. According to popular legend, Lord Krishna’s image in the temple looks exactly like Krishna’s form during his incarnation on Earth. 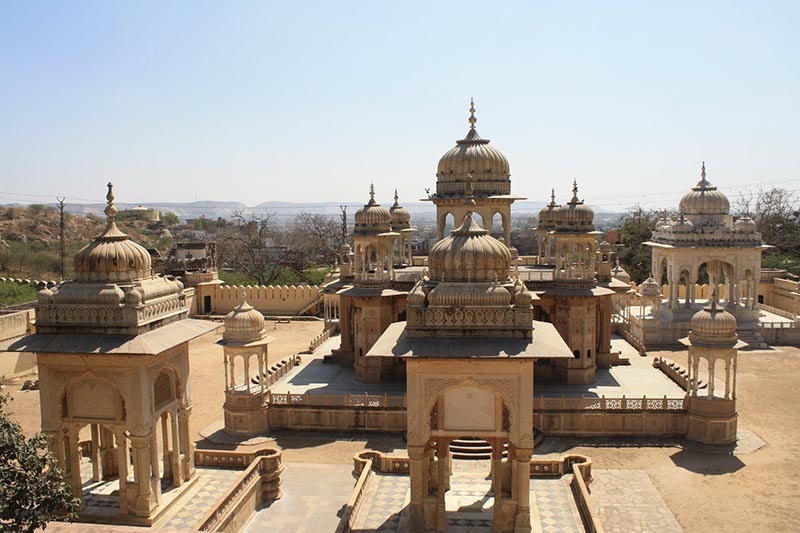 Gaitore Ki Chhatriyan is the royal crematorium grounds for the Kachwaha, a Rajput clan that ruled in the region. It is a fascinating hidden gem. You can take your time while soaking in the quiet atmosphere, though do be respectful and bear in mind the site’s funerary past. St. Thomas Orthodox Syrian Church: Ajmer Road St. 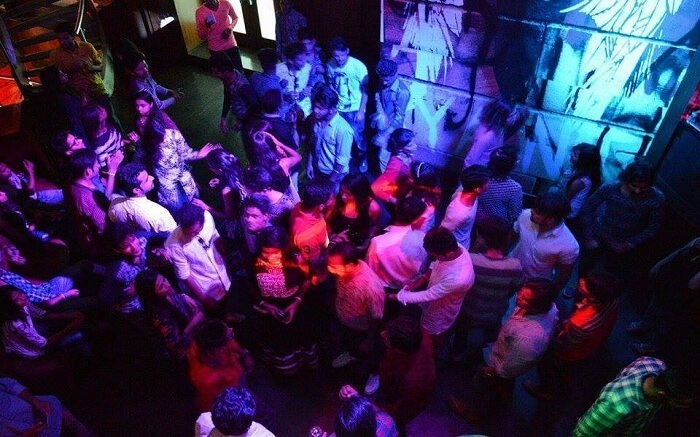 Sway to the tunes of groovy music, enjoy mouthwatering snacks and sip on a variety of cocktails at these nightclubs. The three seasons of Jaipur are – a warm dry winter, an unbearably hot spring/summer and a brief but intense monsoon season. Unsurprisingly the best season to visit Jaipur is during the winter months, from early November through February and this is the height of the tourist season. 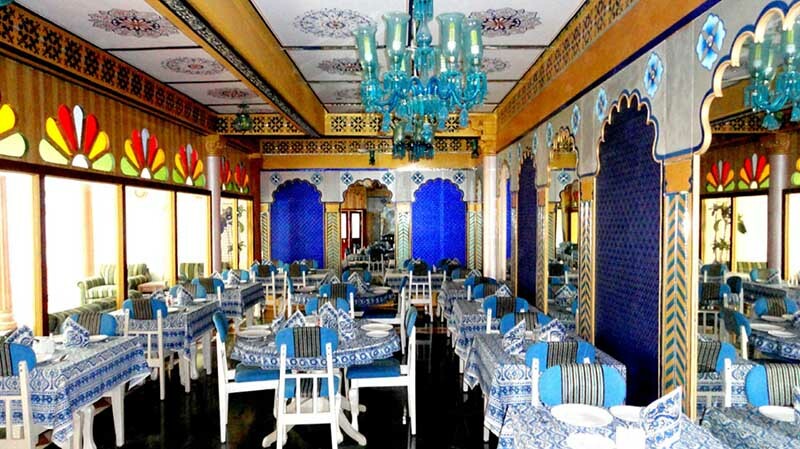 Jaipur is a foodie’s paradise where you will find delicious Rajasthani exotic dishes like Dal-batti-churma, Mawa Kachori, Mirchi Bada, Ghewar, and more. For some lip smacking Lal Maas try Niros or Handi at MI Road, enjoy some Murli ke paan, dine like a Maharaja at 1135 AD, and enjoy traditional mithai at Laxmi Mishtan Bhandar. Take your pick from Dal Baati Churma, Gatte ki Subzi, Laal Maans, Kachori, and the famous Rajasthani Thali, which is a must try. Lassiwala, Rawat Misthan Bhandar, Famous Sahu Chai ki Thadi are the streets from which you must try the street food. You can also go the healthy way and enjoy locally produced organic food at Anokhi Cafe. This is one of the best places to hangout in the city. For sumptuous French delicacies like creme brulees and croissants, try the Dzurt Patisserie and Café. The lassi at Lassiwala is definitely drool-worthy and a must try. Getting around the city with the help of auto is appropriate. Taxis are comparatively safe. Taxis can be used to move around, but they are expensive. You can rely on the drivers for your safety. Auto rickshaws are cheap, but if it is too hot, we advise that you take a taxi. If you want to save money, you can travel by bus. Visit this website which can help you know the bus routes in Jaipur. Have an ethnic experience by riding the cycle rickshaw. This transport can only be seen in India. Jaipur Airport is situated in the satellite town of Sanganer and offers sporadic (chartered) service to London and Dublin. Direct flights to Singapore, Bangkok, Abu Dhabi, Sharjah, Muscat and Dubai are also available. There is an excellent bus service between Jaipur to Delhi by Rajasthan State Road Transport Corporation (RSRTC) with buses approximately every half an hour in both directions. There is also an efficient railway service. There are three major railway stations: Jaipur Junction (main station), Durgapura and Gandhinagar (Jaipur) — which is not to be confused with the Gandhinagar that is the capital city of the state of Gujarat. All trains stop at Jaipur Junction and a few trains stop at Durgapura and Gandhinagar stations also.